Be a Rescue Diver today! That is a standard drill in the Stress & Rescue course when you are to help a panic diver at the surface. Many divers describe the course as the most challenging, yet most rewarding course they’ve ever taken. A Rescue Diver will know how to prevent and manage problems in the water or on the boat. The course is really fun – it’s serious, but still allows for lots of laughter in between the focused learning. This is a non-diving course for anyone who wants to learn how to perform CPR and First Aid. REACT RIGHT training focuses on building confidence in you to respond when faced with a medical emergency. 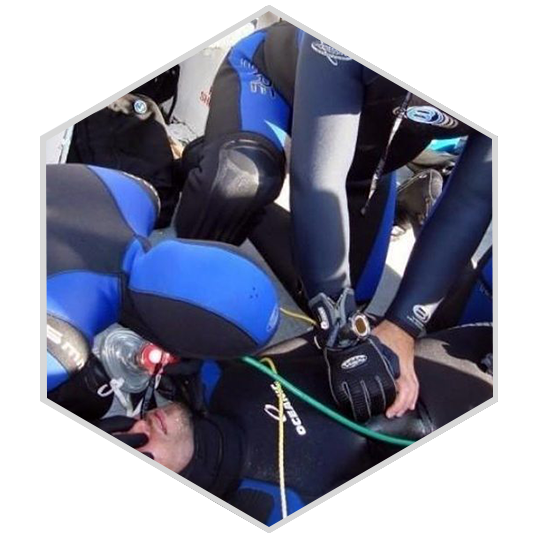 You will learn the "How-To" of First Aid, CPR, AED and Oxygen administration in diving emergencies. You are required to have a valid First Aid and CPR Certificate as a prerequisite for the Diver Stress & Rescue certification.